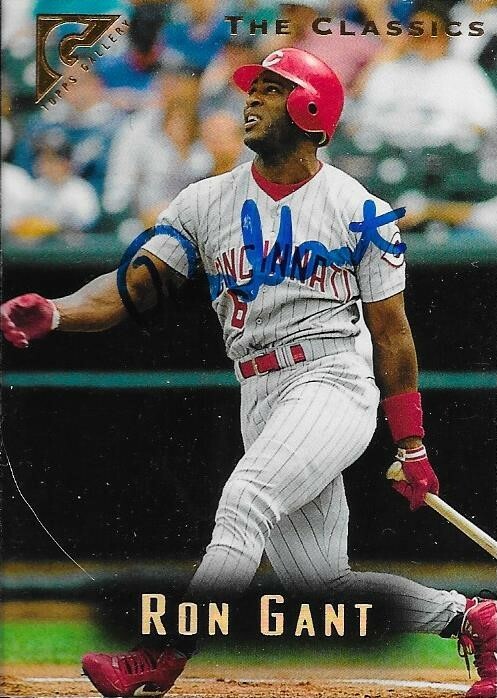 This was an odd TTM success. I mailed a 1999 Fleer Brilliants to Brian Simmons and got this 2000 Upper Deck back instead. My guess is that Simmons liked the card I sent so much, he kept it and sent me this one instead. I'm not upset about it, by any means, but I do think it is odd when a player swaps out cards. Oh well, I still got an auto! Simmons (b. 1973) played in the majors in 1998, 1999 and 2001 for the White Sox and Blue Jays. He had 55 hits, 8 home runs and a .218 batting average. I mailed to Simmons on January 3 and got the card back on January 24, for a 21-day TAT. My first stop at Orioles Fan Fest wasn't an autograph line. It was the Orioles merchandise room. I wanted to see what jerseys were available, and maybe pick up something else that caught my eye. 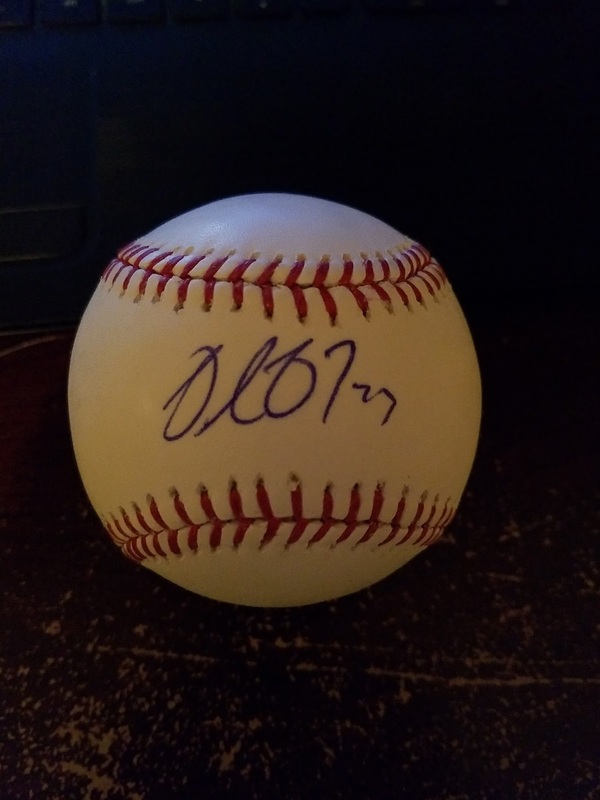 Well, I found a signed baseball for only $10.00, and it was one I have wanted since October 3, 2014. Delmon Young might have a ton of off-the-field issues, but that doesn't take away from the fact that he owns probably the biggest Orioles hit that I have ever seen. The fact that I was there to see it in person makes it even better. I was in attendance, along with my son, Chris and my friend, Ryan, and got to feel the electrifying moment when Young's 3-run double gave the Orioles the lead in Game 2 of the 2014 ALDS against the Tigers. Every time I watch it and hear the crowd erupt, I get goosebumps. It really was something to experience. Young (b. 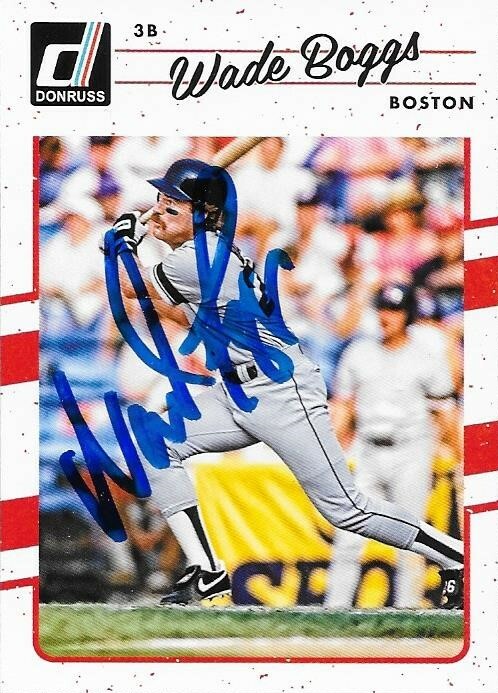 1985) played in the majors from 2006 to 2015 for the Rays, Twins, Tigers, Phillies and Orioles. He had 1,162 hits, 109 home runs and a .283 batting average. He was the 2012 ALCS MVP and always seemed to come up clutch in big playoff situations. Here is that moment from the 2014 ALDS Game 2 that I was referencing. I've been plotting for quite a while to send a TTM request to Wade Boggs again. I finally did it recetly, and am very happy with the cards I sent and had returned. The above 2017 Donruss was a card I really wanted to add to my album. I loved the 1990 design, and I liked that it was resurrected for the 2017 design. The autograph turned out really nicely, as well. These two cards were ones I really wanted done. I already had a Masterpieces in my album, from Hall of Famer, Brooks Robinson. The card on the left is a 1990 Score Dream Team card. It also looks great. 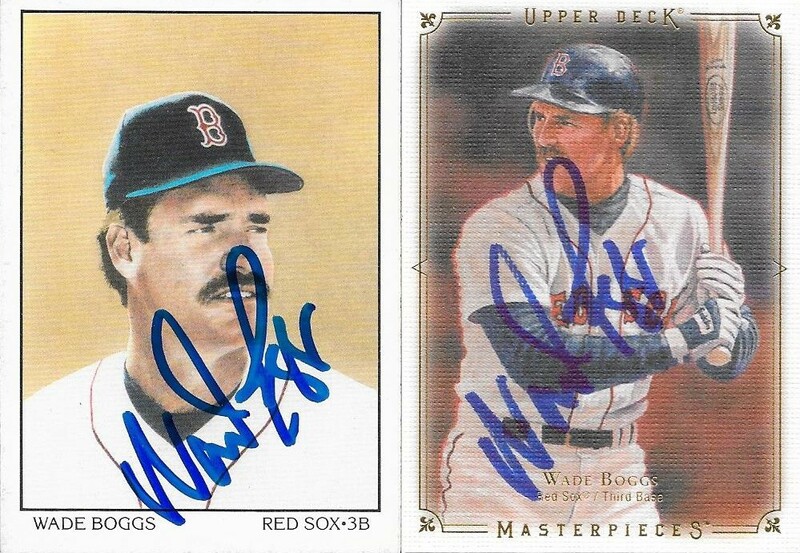 Finally, here are the rest of the cards that I sent Boggs. I thought the "Pressed Into Service" card from 2016 was really cool. I needed the 1987 Topps All Star for my set, and I couldn't leave the 2013 Gypsy Queen White Border out. I mailed to Boggs on January 9 and got the cards back on January 23, for a 14-day TAT. I sent him $10 cash and got all 6 cards back. 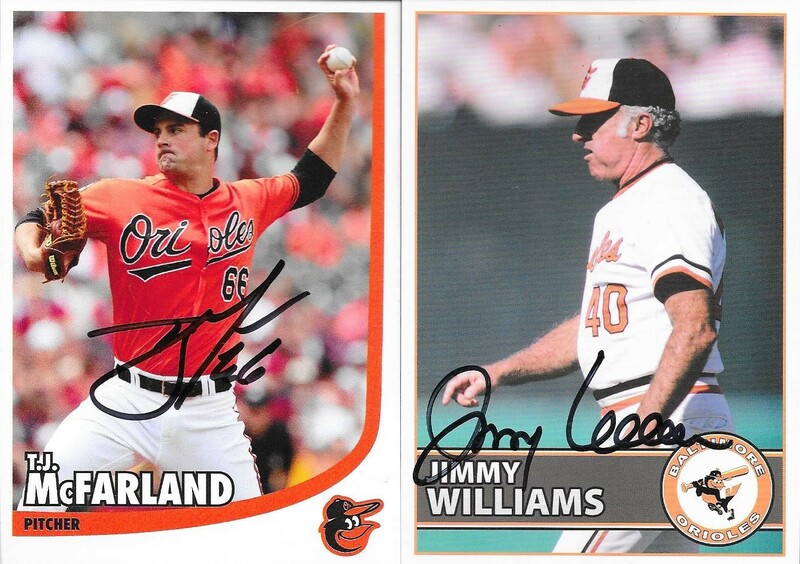 Another Orioles Fan Fest is complete, and this year, I went all out with getting baseball cards signed. I had all five time slots covered this time around, and was able to get multiple cards signed at almost all of them. I also had some help with my son, Chris, my friend, Ryan and also my friend, Michael. 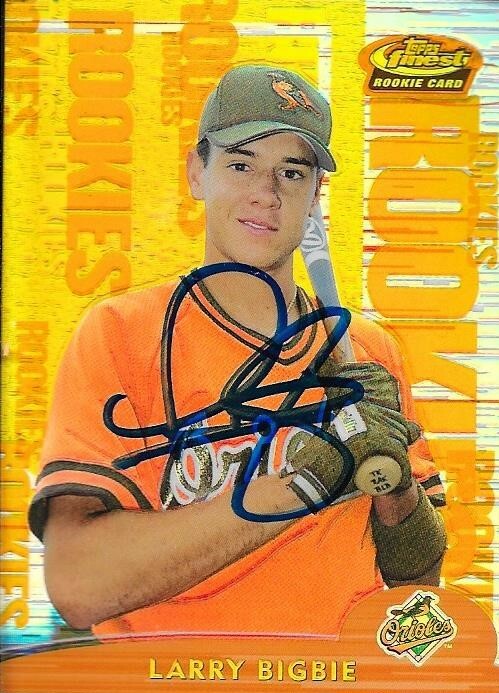 Michael really hit a home run for me by getting this Brady Anderson signed. I know I owe him big for this, as he really loved the card and wanted to keep it. This is a 1998 Pacific Revolution. It looks so awesome in person. 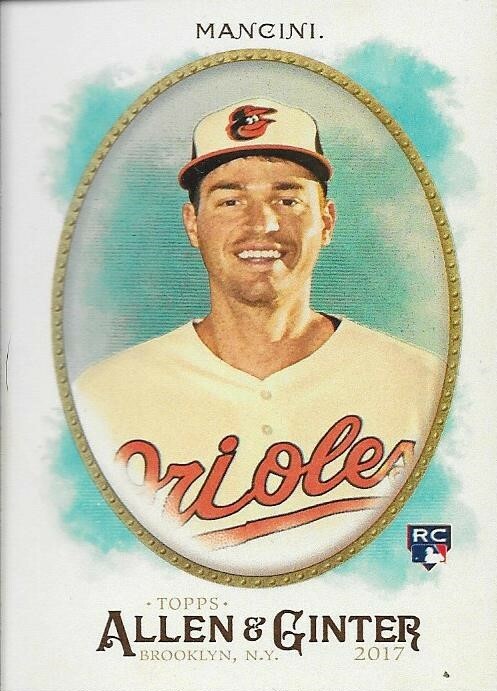 This 2000 Finest Larry Bigbie orange refractor drew a response from Bigbie, himself. He remarked "Wow, that is an old card!" He's right, but it sure is a nice one. I am really happy with it, and only paid a few bucks for it on Ebay. This Nestor Cortes is another pickup. It is a die ccut card numbered 05/99. I was afraid that I wouldn't be able to get it signed, but right when Chris got to the front of the kids line, Cortes came and sat down. It turned out really nice, even though I wuickly had run an eraser over it right before he signed. Thankfully, my mom had given me a pack of the giant pink erasers a couple weeks ago. I put them to good use this weekend. 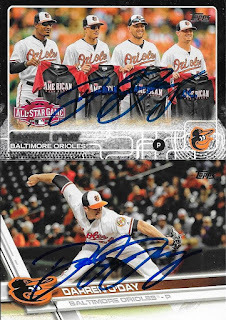 Darren O'Day was the first person we got, and the above 2015 Topps black parallel was one I was really excited to get signed. I had bought it for a few bucks from my friend, Anthony, and really wanted to get it done. 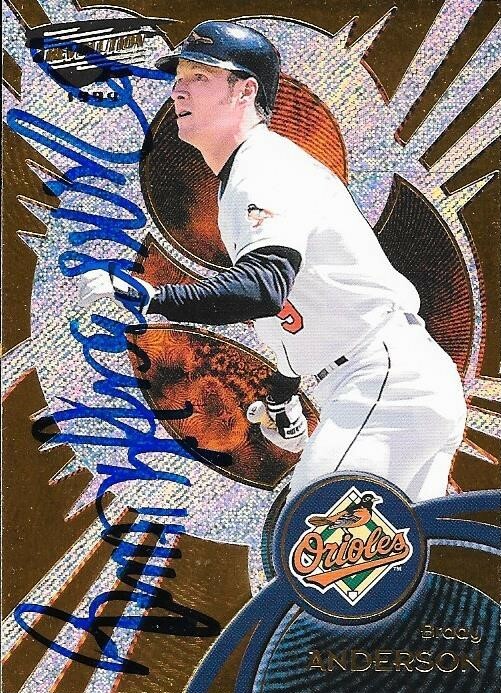 I had sent O'Day a gold parallel of that card to Spring Training last season, but never got it back. 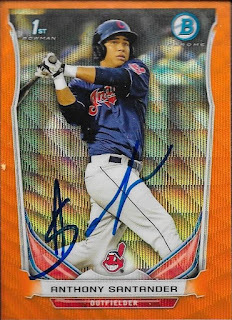 I had Chris get me the 2017 Topps, mainly because I wanted to puff up some of my Topps set numbers. I wanted to get parallels and refractors done mostly, but I was able to add a few Topps base here and there. 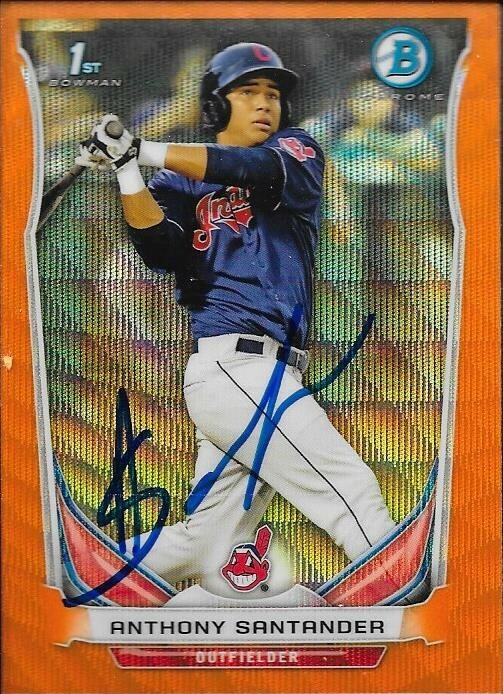 I bought this Anthony Santander orange shimmer from 2014 Bowman Chrome last week, once I knew who's vouchers I had. I saw it on Ebay for something like $6.00, but was able to get it cheaper from sportlots, instead. This 2011 Topps Chrome orange parallel of Adam Jones was featured on this blog a long time ago, in a care package from my friend, Pete. I had narrowed all of my Jones cards down to four, with Chris taking two, and I taking two through the line. The handler denied Chris's second card, so I quickly put my second away and went with this one. I had a recurring theme the whole time with orange parallels, and I'm not complaining at all. It sure turned out nice. Tim Beckham denied me a second card, but he signed two for Chris. They all turned out really well. 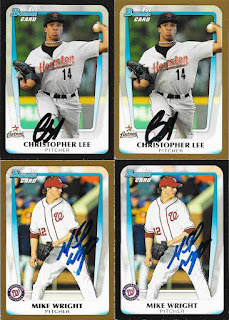 I especially like that Chris, himself, requested that Beckham sign the Heritage Minors in blue. It really looks good. 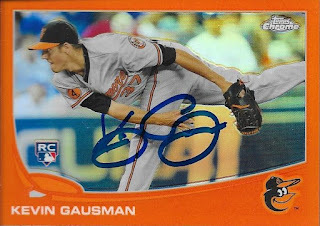 Here is another orange parallel, this time from Kevin Gausman. This one turned out so well. I'm glad I raided my PC boxes for some nice parallels. I got four cards signed by Trey Mancini. The Panini National Exclusive was given to me by a little guy named Reid at this past year's National. I've been trying to message him, but haven't gotten a response since then. He was ahead of me in the line to get in that last day of the National, and ended up walking around with me for a while. The middle Topps Gallery was a gift from my buddy, Cal, and I am really happy that I brought it along to get signed. It is hard to tell, but that is an Artists Proof card. Finally, I really wanted an Oriole on a 1987 Topps Chrome from this past year, just to keep up with my 1987 Topps theme in my albums. 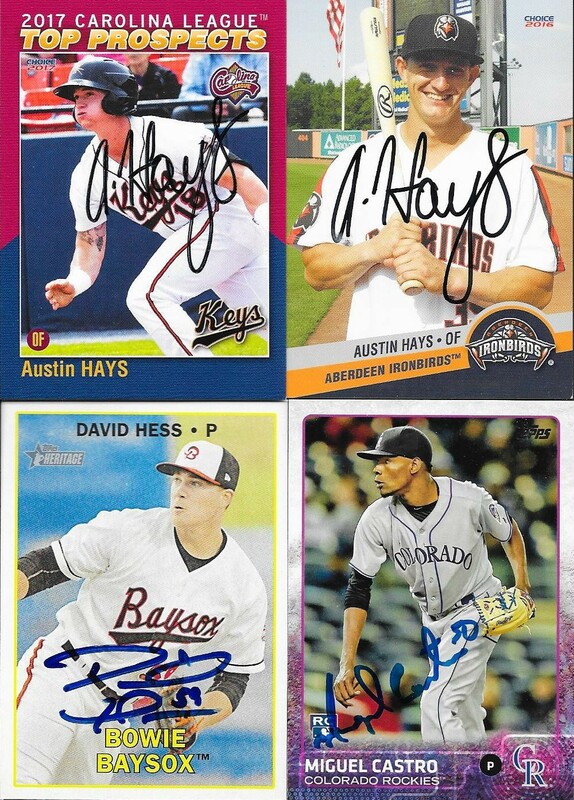 I also got four cards signed by Hunter Harvey. 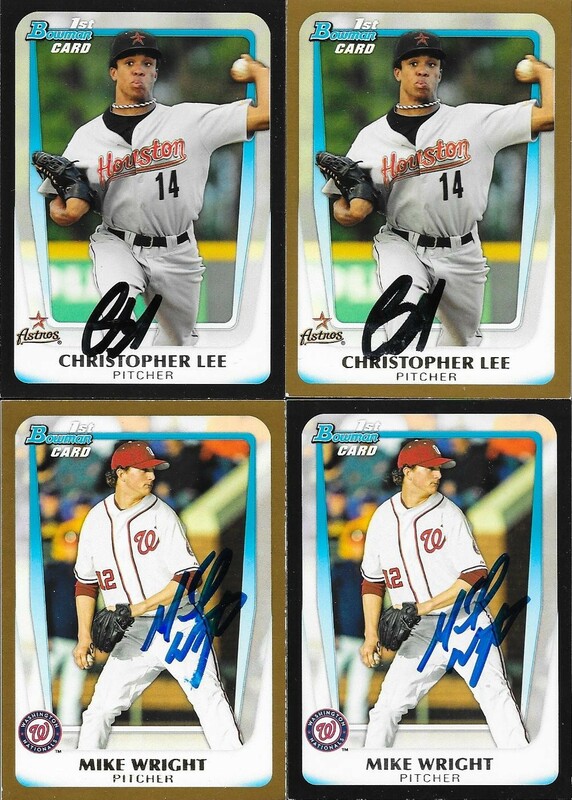 The 2014 Bowman Chrome gold parallel on the right is numbered out of 50, and turned out really nice. I have a bunch of other Harvey cards. If he goes to Frederick to start the season, I may be able to get him when they come through Kinston. 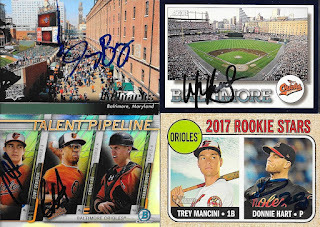 I put some dime box pickups from this past year's National to good use at Fan Fest. All of these Mike Wright and Chris Lee cards were dime box finds that I held onto. The Wright cards are misprints, of course, as he never was a National. I added three cards to the 1987 set while I was at Fan Fest. Michael got Larry Sheets for me, and Ryan hooked me up with John Russell. Here are some horizontal cards that I was able to get done. The 2010 Upper Deck was from Ryan, and had Jaycob Brugman's signature on it. The 1994 Score is Wane Kirby. I had to bring the generic Orioles cards, in case I saw someone I didn't have cards of. I was glad to use my 1994 Score. The Upper Deck was one Ryan brought. 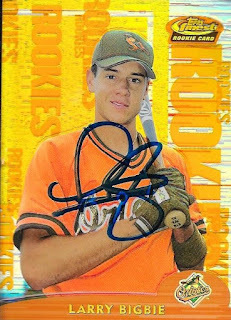 I kind of wish I had gotten a voucher of Chance Sisco, since I found my Bowman Pipeline card that I had Cody Sedlock sign this summer. Chris got it signed by Chris Lee in the kid's line. Lee said Sisco was on his way, but we were late for our 2:00 signing, anyway. Maybe next year. Here is a batch of other cards I was able to get done. We had a session with Joe Orsulak, and he also was in the kid's line. The Orsulak in the middle is a Bowman Tiffany, which turned out really nice. 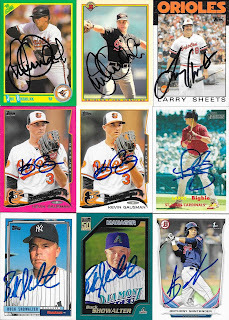 Chris laid down three Alan Mills cards in the kid's line, and Mills signed them all. 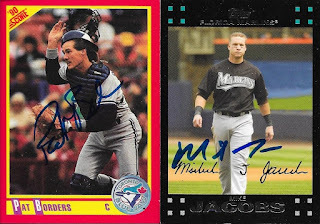 I was glad for that, as I couldn't decide if I liked the 1995 Fleer over the 1993 Topps. Ryan contributed the 1993 Ultra, and let Chris keep it. 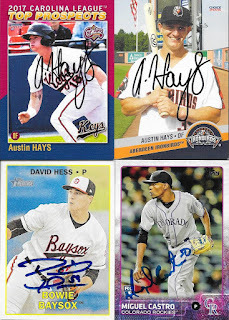 Finally, Austin Hays signed two cards for me in the first session we were in. Chris got an 8x10 signed. I had my autograph book with me for that session, and Hays said he would do two of the four I had on my page. I was fine with that, as it meant I could get one of the Carolina League Prospect cards signed and his Aberdeen team set card done. I abandoned the book after that session and just tried two-per for each station, and it worked pretty well. Ryan got the David Hess signed for me while I was in line for the last session. He had my card box with him while I was in line and remembered that my box was alphabetized (and he remembered me saying I had one Hess card in there). Michael got me the Miguel Castro. In all, I left Fan Fest with 56 autographs on baseball cards. Not a bad way to start the year. I have a few other things from Fan Fest that I will show later on between TTM successes and a couple more Christmas gifts that came in, so stay tuned! I was complaining last week about TTMs being slow to come in, and maybe also working toward getting caught up on posts. Well, I just got back from Orioles Fan Fest and had 5 TTMs and a Christmas gift waiting on me. I've got plans with Chris tonight, so I won't be blogging about Fan Fest until tomorrow, but in the meantime, I can get a TTM posted, so there will be one less waiting on me. I got some nice 70s cards signed by Rich Folkers. The above 1975 Topps was one of the many that Max gave me a while back. 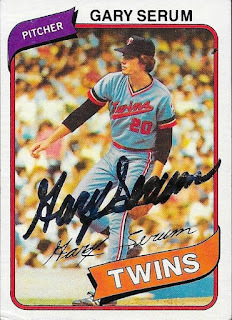 This 1974 Topps also turned out pretty well. I like how Folkers inscribed the year with his signature. Folkers (b. 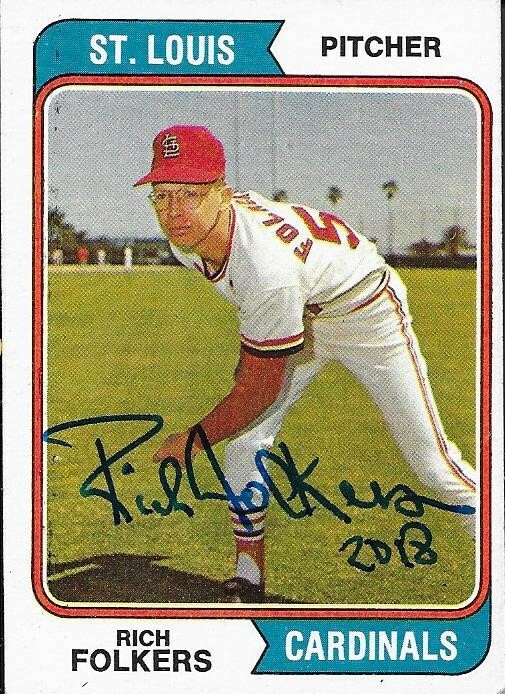 1946) played in the majors from 1970 and 1972 to 1977 for the Mets, Cardinals, Padres and Brewers. He had a career record of 19-23 with 242 strike outs and a 4.11 ERA. I mailed to Folkers on January 11 and got the cards back on January 23, for a 12-day TAT. 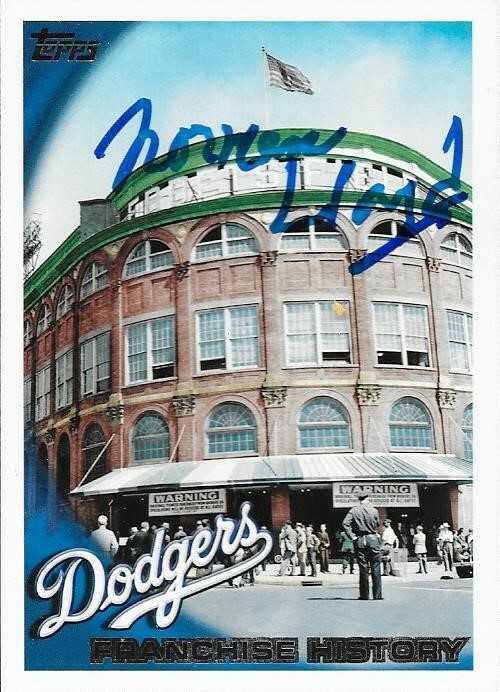 This was a really cool TTM success that came in a few days ago. I got the idea from my buddy, Chance, to send to actor, Norman Lloyd following his appearance at the World Series this past October. Apparently, Lloyd is the oldest living former World Series attendee, having attended the 1926 World Series in New York. Lloyd attended that World Series as 12 years of age and watched Babe Ruth split his pants on a slide. In 2017, at the age of 102, Lloyd witnessed a game between the Dodgers and Astros at Dodger Stadium, some 91 years later. Lloyd (b. 1914) was a close friend of Alfred Hitchcock, having worked with him on Saboteur and Spellbound. He is also known for roles in St. Elsewhere, Twilight Zone and Deat Poets Society. Here is a link to the LA Times article regarding Lloyd's visit to the World Series. I mailed to Lloyd on November 18 and got the card back on January 23, for a 66-day TAT. I had these Bobby Meacham cards in my "to be TTMed" box for a long time, and I finally got around to sending them out. 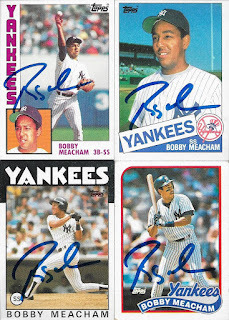 Meacham signed them all, and they turned out really nicely. The above 1987 is obviously for my set, and the ones below were some more Topps cards to add to the album. I was able to get a 1984, 85, 86 and 89 signed by Meacham as well. Meacham (b. 1960) played in the majors from 1983 to 1988 for the Yankees. He had 324 hits, 8 home runs and a .236 batting average. I mailed to Meacham on January 9 and got the cards back on January 23, for a 14-day TAT. Today, four new members of the National Baseball Hall of Fame were announced, and two of them I already had on baseballs. Adding these two Hall of Famers puts me at 137 Hall of Famers in total. 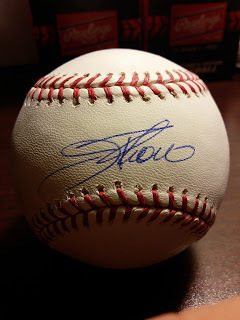 I had picked up this Jim Thome at the 2016 National and blogged about it here. Check the link for a breakdown of Thome's stats. He was one of my favorite players in his career, and now he is a Hall of Famer. I am really excited because he is a former Kinston Indian, and, as far as I know, the first Kinston Indian to be elected to the Hall of Fame. Here is my Thome bobble head from a promotion back with the Kinston Indians. I am really glad that I picked up this bobble head when I did. I just realized that I never posted this Vladimir Guerrero signed baseball that I picked up at last year's National. I thought I got around to it, but I guess I never did it. I got the ball for a steal, and am glad I did. Guerrero (b. 1975) played in the majors from 1996 to 2011 for the Expos, Angels, Rangers and Orioles. He had 2,590 hits, 449 home runs and a .318 batting average. He was the 2004 AL MVP while with the Angels, and was an All Star 9 times. He was named on 92.9% of the ballots cast and was elected in his second year of eligibility. Thome was named on 89.8% of the ballots; this was his first time on the ballot. He and Guerrero will join Chipper Jones (97.2%, first ballot) and Trevor Hoffman (79.9%, third ballot). Also being inducted for 2018 are Alan Trammell and Jack Morris, who were named in December by the Modern Era Committee (Veterans Committee). Falling short were Edgar Martinez (70.4%, ninth ballot) and Mike Mussina (63.5%, fifth ballot), among others. Both Thome and Guerrero finished their careers as Orioles, which is kind of cool, I think. 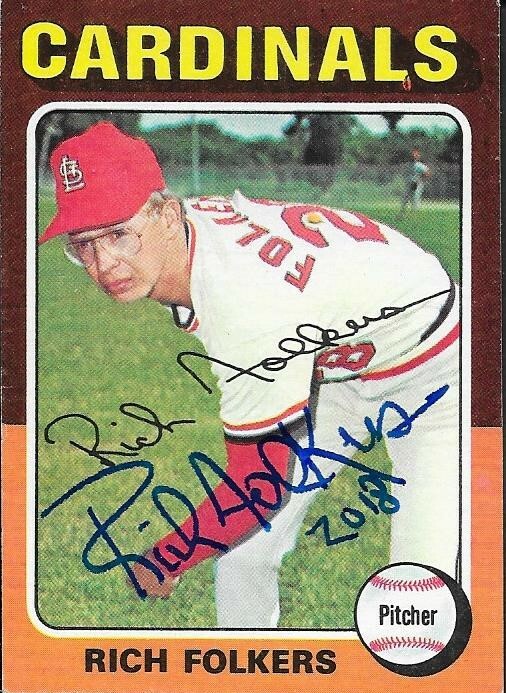 Here is a TTM success from a guy who has been sitting in my box for quite a while. 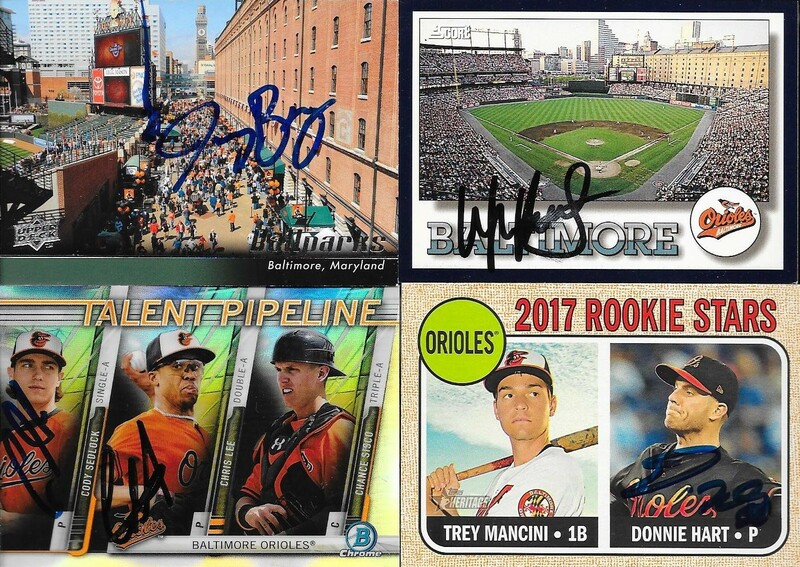 I sent out a bunch of TTM requests over the last few weeks, and a lot of them are ones that I have finally gotten around to sending. There will probably be a glut of 1987 Topps coming in soon, so it was nice to get this one in of some cards from 1979 (above) and 1980 (below). Serum (b. 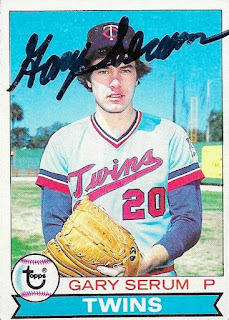 1956) played in the majors from 1977 to 1979 for the Twins. He had a career record of 10-12 with 125 strike outs and a 4.72 ERA. I mailed to Serum on January 10 and got the cards back on January 19, for a 9-day TAT. Christmas Package From Dylan D.
I got a Christmas gift in the mail recently from my friend, Dylan, in Connecticut. He and I have connected recently and did a few 50/50s this past season. Dylan sent me a message saying that the package wasn't much, but I really enjoyed what I got. 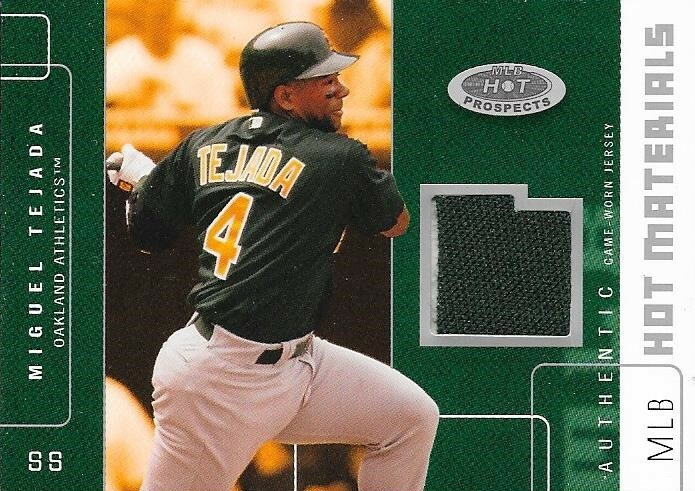 This Miguel Tejada relic is numbered 386/499 and is a pretty nice card. I had hoped somewhat that CC Sabathia would sign with the Orioles this winter, but that wasn't the case. Oh well. 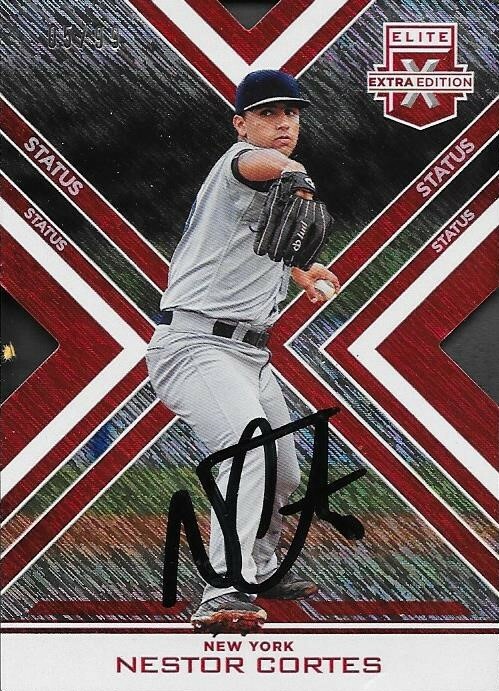 This is still a nice card; from 2012 Topps. Finally, here are a couple IP autos that Dylan got and sent along. 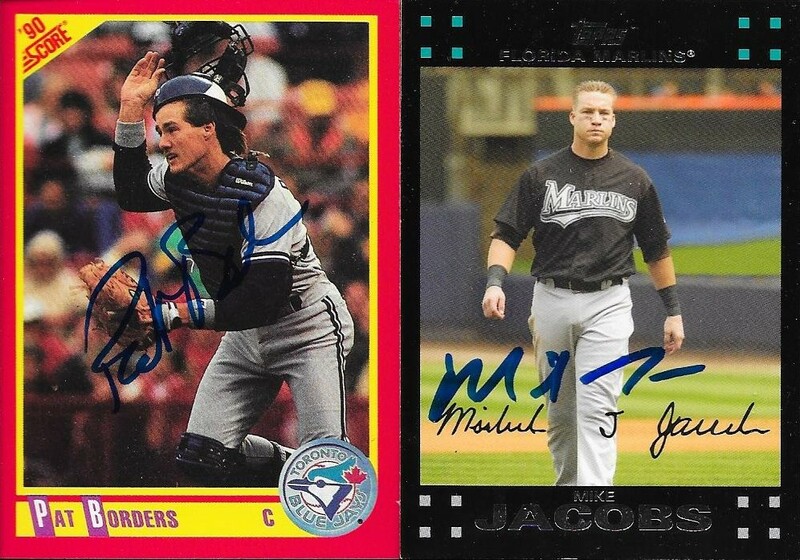 I had sent him a few Mike Jacobs cards, and I was glad to get one back for my album. I didn't realize he saw Pat Borders, so I may have to take a look and see if I can send a few back to him. Thanks so much for the package, Dylan! I really appreciate it! TTMs have still been really slow to come in lately. That can only mean that at some point, I'm going to have a huge mailday. One of the ones that has trickled in lately was this success from Steve Busby. I enjoyed this 1974 Topps that I was able to get signed by him. It must be a photo from Spring Training, as evident from the aluminum bleachers in the background. He also signed these three cards for me, from left to right, 1976, 1978 and 1980 Topps. Busby (b. 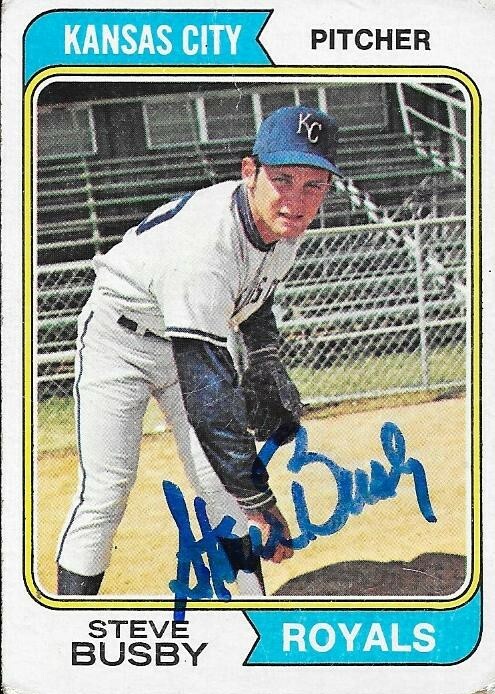 1949) played in the majors from 1972 to 1976 and 1978 to 1980 for the Royals. He had a career record of 70-54 with a 3.72 ERA and 659 strike outs. He won 22 games for the Royals in 1974. 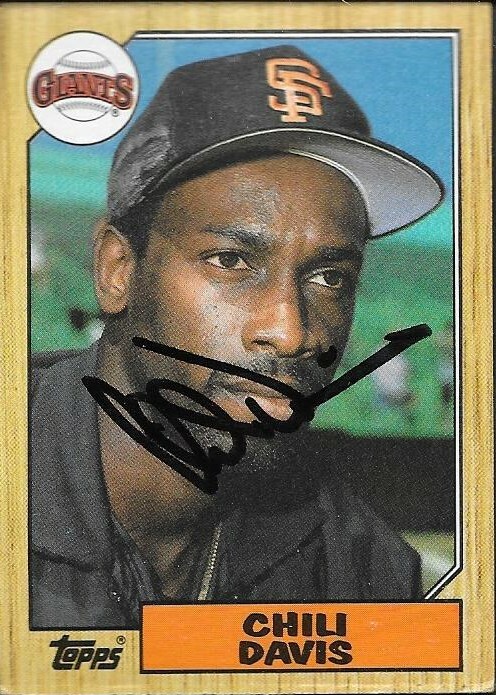 He was an All Star in 1974 and 1975 and finished 30th in the 1974 AL MVP race. I mailed to Busby on January 2 and got the cards back on January 16, for a 14-day TAT. 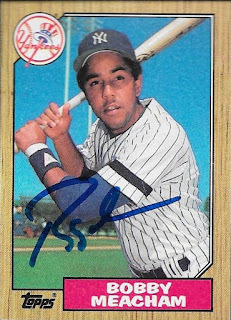 Max was able to go to Cubs Convention recently, and he was able to hook me up with some autos on 1987 Topps that I needed. 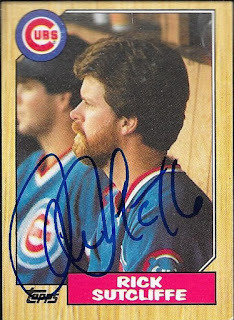 The above 1987 Rick Sutcliffe was really nice, especially since we both tried to get him this summer when we were at the game at Wrigley. We missed a little over an inning trying to get Sutcliffe, but were unsuccessful. I finally have him for the 1987 set, so that helps out a lot. 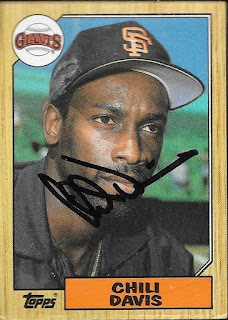 I sent Max a few Chili Davis cards when I found out he would be a Cubs coach this season. Max didn't really want any more of his cards, but I was holding out hope that he could pull off some magic and get one signed for me. Thankfully, Max is amazingly selfless and was able to hook me up. I really appreciated him helping me out and getting this card done for me. Thanks so much, Max! These are headed straight for my album! 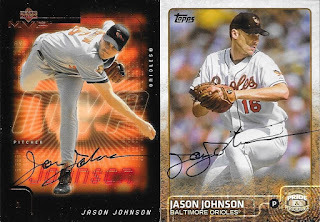 Initially, I was really excited to get these cards back signed from Jason Johnson. That is, until I posted them on my Instagram and had someone comment saying that they were ghost signed. I took a look at certified autos of Johnson and they do appear different that certified autos of his. That's not to say that he didn't rush the signatures or that he signed cards differently than he signs balls and photos. I probably have a few other subjects who may have ghost signed, but I don't know for certain. Ghost signed means that someone else signed them on Johnson's behalf (maybe an agent, or his wife). 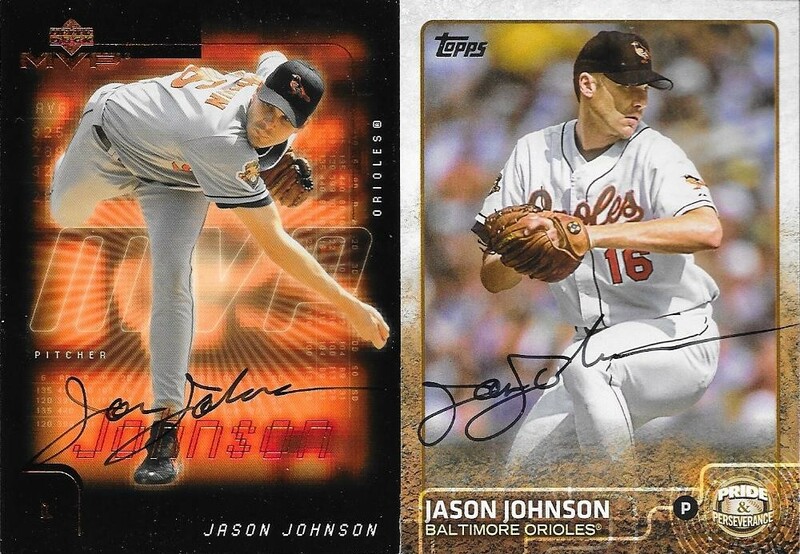 Still, these cards were sent to an address listed for a Jason Johnson, and they came back signed. I will treat them as such and still will put them in my album. These two cards were the ones I was most excited about. Especially the 2015 Topps Pride and Perseverance. It is a really cool card that talks about Johnson's use of an insulin pump while he pitched. Johnson (b. 1973) played in the majors from 1997 to 2006 and 2008 for the Pirates, Devil Rays, Orioles, Tigers, Indians, Red Sox, Reds and Dodgers. He had a career record of 56-100 with an ERA of 4.99 and 810 strike outs. 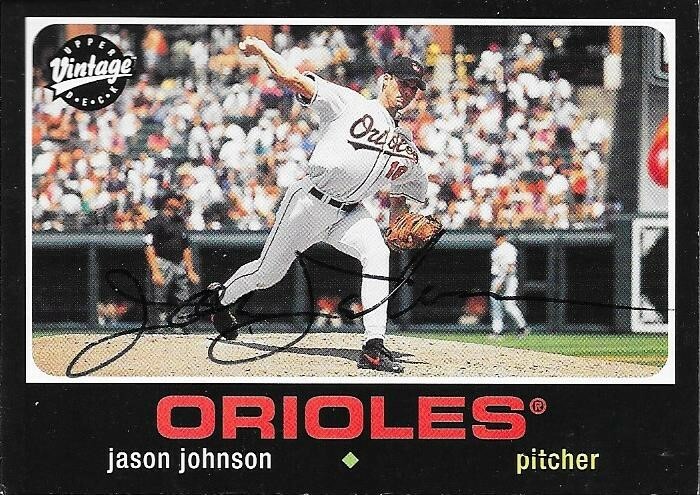 The Orioles picked Johnson up in 1999 in a trade with the Devil Rays for former Orioles prospect, Danny Clyburn. I mailed the cards to Johnson on January 2 and got the cards back on January 13, for an 11-day TAT. I got a nice Christmas package in recently from my friend, Ethan, that had a ton of Orioles signed postcards. The biggest name in the bunch was the above JJ Hardy signed card. 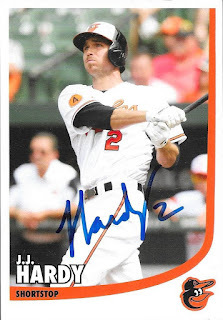 I really enjoyed Hardy's time on the Orioles, and now that he is a free agent, he will be sorely missed. 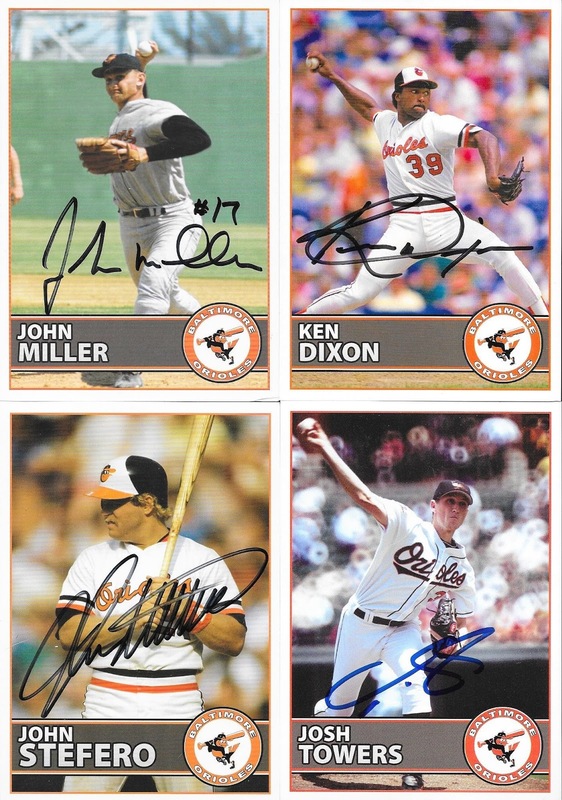 Here are some nice Orioles alumni that Ethan included, John Miller, Ken Dixon, John Stefero and Josh Towers. I don't believe that I have met any of these guys, so it was cool to get their autos from Ethan. Finally, here are the last two guys, TJ McFarland and Jimmy Williams. McFarland is still playing in the majors, and Williams was a former coach for the Orioles who passed away in 2016 at the age of 90. I now have an album for signed postcards, so these will all be put in there. Ethan also included a team bag of Orioles cards for my collection. Thank you so much for the awesome gift, Ethan! I really appreciate it. I picked up some vintage cards when I was at the Greenville card show a while back, as you all know. I still have a few cards here and there of guys that I had picked up. Most of them are guys who charge for autos, like this success from Willie Tasby. I was excited for this one because I was able to add a former Oriole that I hadn't heard of to my album. 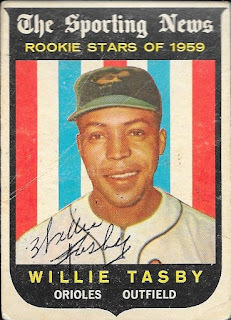 I was also happy to add this 1959 Topps Rookie card to the album, as it was something a little different than the regular 1959s that I have been able to get. 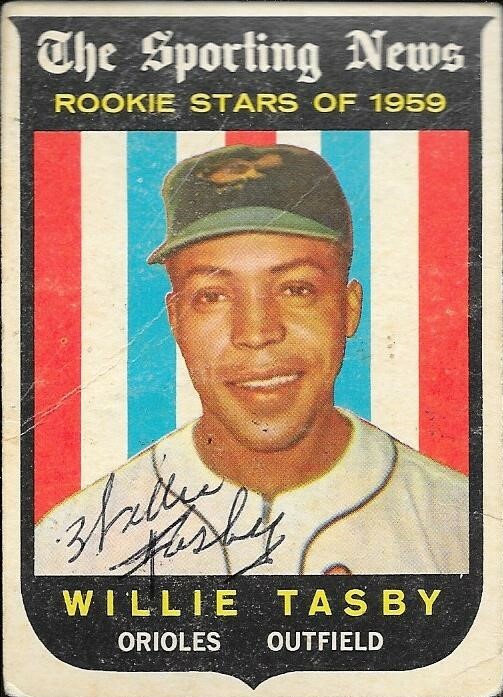 This 1960 Topps was also really cool to add to the collection. 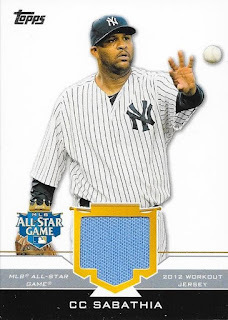 I know a lot of folks love the Topps All Star Rookie trophy cards, so this was a cool one to put away. Tasby (b. 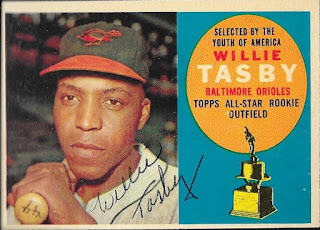 1933) played in the majors from 1958 to 1963 for the Orioles, Red Sox, Senators and Indians. He had 467 hits, 46 home runs and a .250 batting average. I mailed to Tasby on January 3 and got the cards back on January 12, for a 9-TAT. I paid his fee of $5/card. Believe it or not, Christmas packages are still rolling in, and this one was from my good friend, Drew. He sent me this awesome Manny Machado patch from 2016 Topps Strata and also a 25th Anniversary Camden Yards logo OMLB. 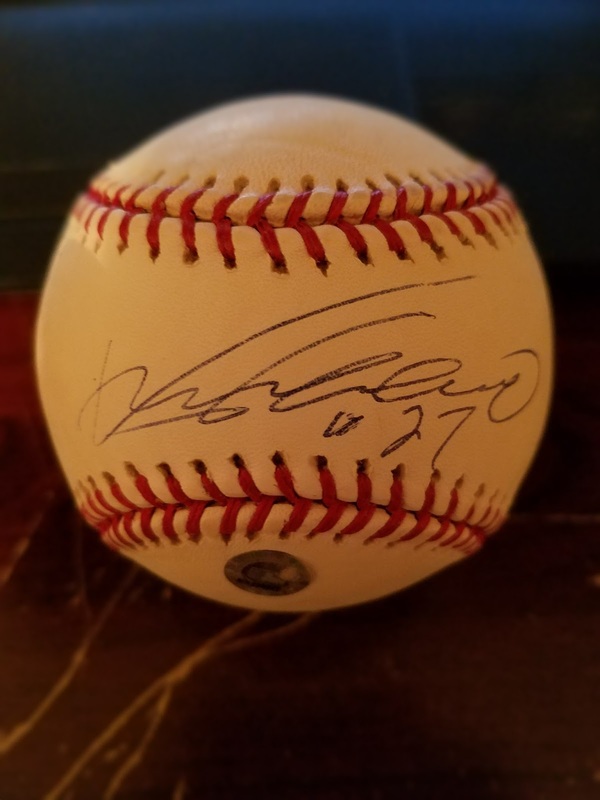 I'll probably get the ball signed sometime soon; maybe at Fan Fest. 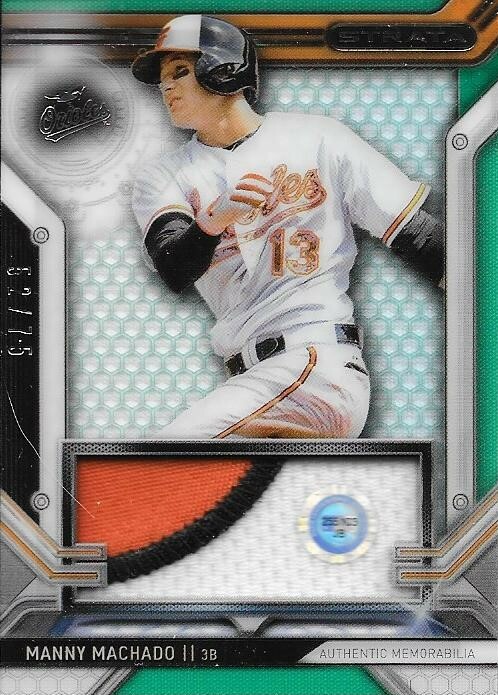 The Machado card is really nice and numbered 52/75. 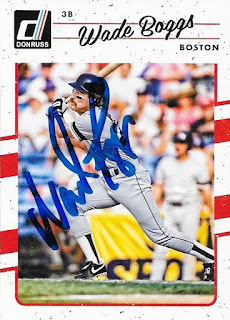 Drew probably really liked this card and I'm sure he is hoping I re-gift it back to him once the Yankees trade for or sign Manny. I kid, I'll keep the card, regardless! Thank you so much for the gifts, Drew! I really appreciate it! I got a nice care package in recently from my friend, Xavier, that had a bunch of Orioles cards. I hadn't had much of a chance to talk to Xavier recently, since he has been so busy at college. Still, that didn't stop him from sending a little something my way. I really appreciated the gesture. 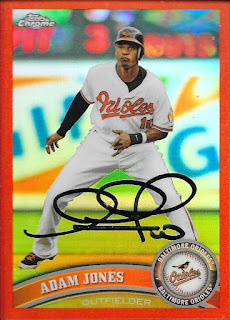 There were a bunch of Orioles cards in there that I needed in my collection, so it really worked out. Thank you so much for the package, Xavier! 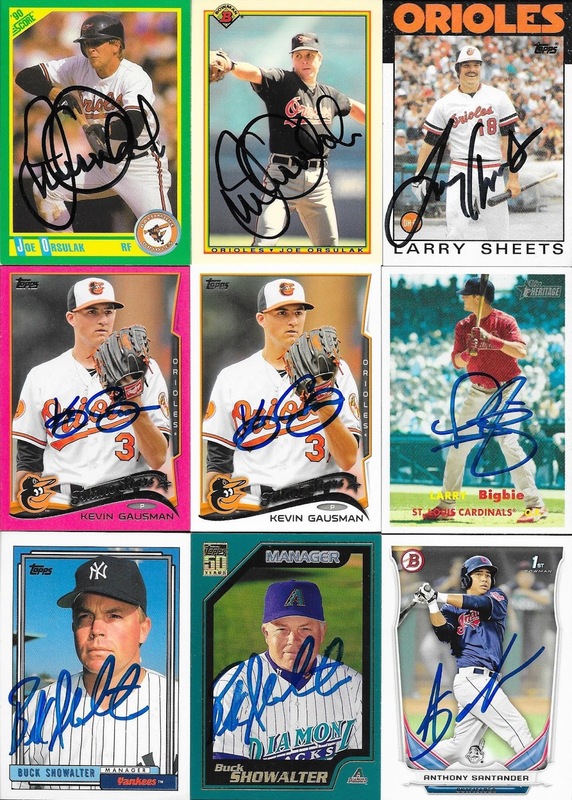 I sent off a bunch of TTM requests to start the new year, and a few of them were of guys I had gotten in the past. Sid Bream, for example, was someone I needed on some 1987 Topps cards. I sent a few 87s out to a few other guys to see if I could get them back. Ron Gant doesn't have a card in the 1987 set, so I thought I was done sending to him. 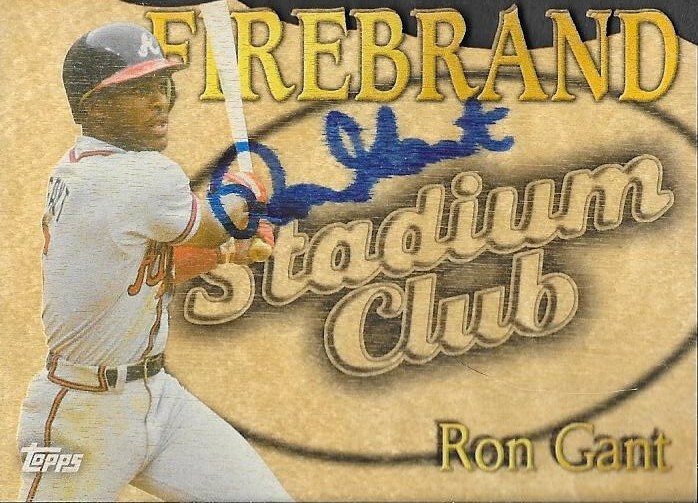 That is, until I found the above 2014 Stadium Club Firebrand insert at my LCS. The card floated around my card room for about a year, until I finally put it in my "to be TTMed" box. I ended up sending it out earlier this month, and am glad I did so. It is made of wood, and turned out pretty well. I was afraid it would break in transit, but it turned out ok. I added a few other cards to the request, including this 1996 Gallery that I picked up while I was visiting Andrew back in May. I also wanted to add a couple Topps cards to the pile, so I sent a 1989 and a 1999. What a huge difference 10 years makes. 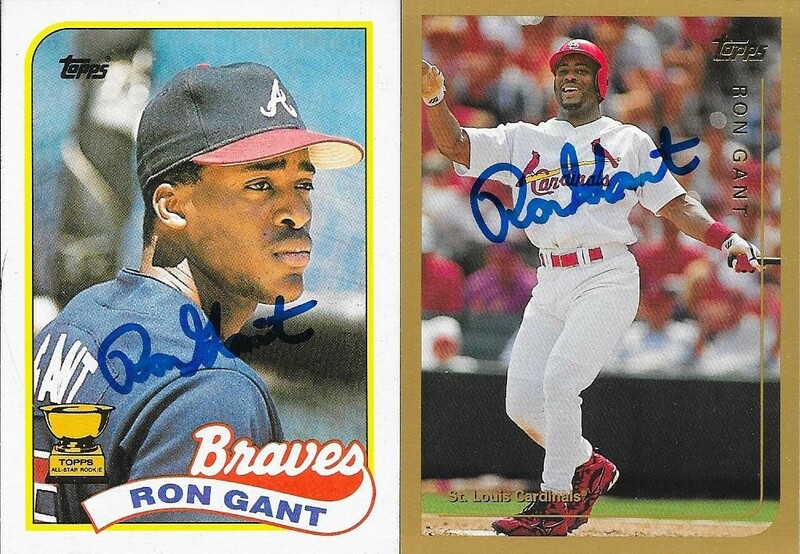 I mailed the cards out to Gant on January 2 and got the cards back on January 11, for a 9-day TAT.